Men’s hair is a big part of our offering here at Jakata. All the team are highly skilled in men’s cutting and styling and we pride ourselves in creating up to the minute men’s looks whilst offering a relaxed, professional experience. Myself, Natalie and Laura H attended a barbering course on Monday at a salon in Manchester. When we got there we were introduced to the team and had a run through of our day which started with 2 demonstrations each by both Marcus and Peter. Marcus was working on both of his twin boys while Peter worked on members of their own staff. We also had our Schwarzkopf technician Steve accompanying us on the course which made us feel more relaxed with him being a familiar face. 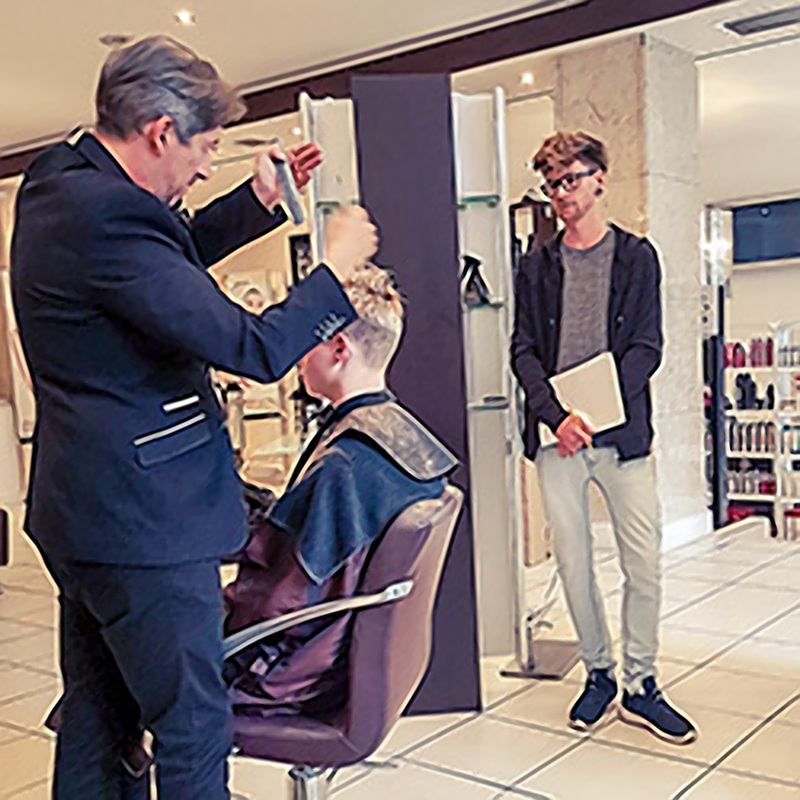 The main focus was scissor over comb cutting opposed to clippering hair to create a more bespoke personalised service and to educate our own clients on the benefits of scissor cutting. Scissor cutting lets us create a cut that isn't a “generic guard” on a set of clippers and also makes the style last longer as the cut grows out into an actual style without the “grown out clipper” look. We were also taught various other techniques including how to create intentional weight lines within the hair, how to offer different styles on men with already short hair as well as establishing styles for men with longer hair without them looking feminine. After the demonstrations we were provided with mannequin heads to practise our newly discovered skills! We were made to feel at ease and encouraged to ask questions to get the most that we can out of the course so each of us were constantly picking Peter and Marcus’s brains. Nat created a “gentlemens” style while Laura went for a slick back look and I cut in a textured undercut style, we all used scissor over comb and incorporated weight lines into each of our cuts. It was really difficult at first, being something that none of us had focused on before, but by the time we were finishing we all had perfected the techniques and were really excited about bringing this back to JAKATA. Overall we had a brilliant day and took techniques from the course that will allow us to offer better quality services to our male and (some) female clients also! We got to keep our mannequin heads for reference and left the salon (aka Schwarzkopf HQ) feeling really positive and upbeat so THANK YOU!